On August 27, 2015 at approximately 7:00 PM, a resident of Suncrest Drive in Kingsport reported her gold 2004 Kia Rio stolen. The vehicle was recovered the next day after being found abandoned in the 300 block of Lynn Avenue. 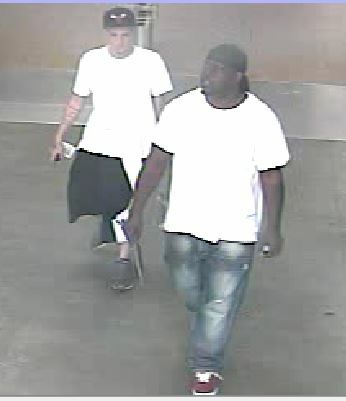 While processing the vehicle for evidence, Detectives located a receipt for a transaction that had occurred on August 27, 2015 at Wal-Mart, located at 2500 West Stone Drive. At the time of the visit to Wal-Mart, a female was driving the stolen Kia, and two passengers, consisting of a white male and a black male, entered Wal-Mart to make a purchase. The female driver remained in the vehicle. Photographs taken from surveillance video of the two passengers traveling in the stolen vehicle have been included in this release. Anyone who recognizes either of them or who may be able to identify their female accomplice is asked to contact Detectives in the K.P.D. Criminal Investigations Division at 423-229-9429 or call Kingsport Central Dispatch at 423-246-9111.